An inter-sessional meeting of the U.S.-Sri Lanka Trade and Investment Framework Agreement (TIFA) Council meeting was held on September 1, 2016 in Colombo, Sri Lanka. The meeting was Co-Chaired by Sri Lanka Minister of Development Strategies and International Trade Malik Samarawickrama and Assistant U.S. Trade Representative for South & Central Asia Michael J. Delaney, representing the governments of Sri Lanka and the United States of America, respectively. U.S. Ambassador to Sri Lanka Atul Keshap and Department of Commerce Assistant Secretary for Global Markets and Director General of the U.S. and Foreign Commercial Service Arun M. Kumar delivered opening remarks, praising the newly elected Sri Lankan government’s commitment to democracy, accountability, human rights and economic reform while noting that there was significant scope to expand on the existing trade and investment relationship where the United States is the number one destination for Sri Lankan exports. Ambassador Keshap noted that the United States, through a number of ongoing assistance programs, seeks to further strengthen the strong economic ties with Sri Lanka. AUSTR Delaney recalled USTR Ambassador Michael Froman’s remarks during the April 28 U.S.-Sri Lanka TIFA Council meeting, in which he noted that the concrete and specific initiatives developed within the TIFA will strengthen Sri Lanka’s trade and investment regime and mobilize more of the Sri Lankan population to participate in a trade oriented economy. Minister Samarawickrama highlighted the reforms that the Government of Sri Lanka is undertaking to improve the ease of doing business, facilitate greater exports, increase regional integration, attract foreign direct investment, and to support reconciliation. He emphasized Sri Lanka’s interest in the establishment of preferential trade programs such as Qualifying Industrial Zone (QIZ), especially for the economic improvement of the Northern and Uva Provinces in the country. 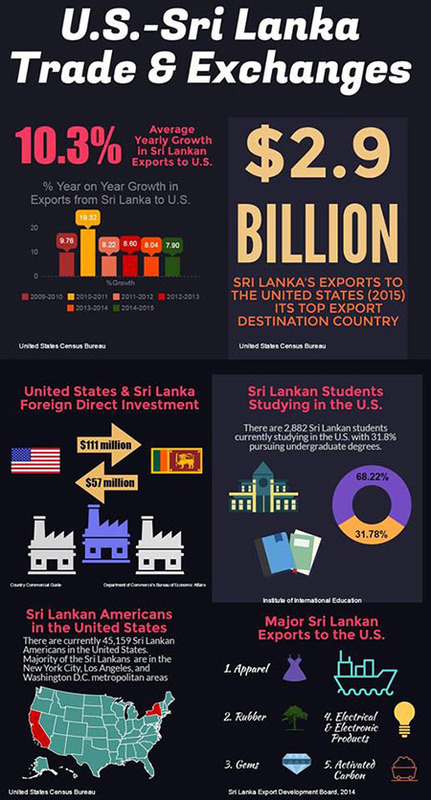 At the conclusion of the April 28 TIFA Council meeting, a U.S.-Sri Lanka Joint Action Plan to Increase External Trade and Investment was adopted. Both sides affirmed their belief that the bilateral trade and investment relationship has great potential that can be realized through adoption of enabling measures jointly incorporated in the Plan. The Joint Action Plan aims at reaching its goals over a span of five years. At the April 28 meeting both sides also committed to deepening their engagement over the coming months in order to develop a detailed implementation plan for the Action Plan based on specific proposals submitted by Sri Lanka on improving export competiveness, technical and financial assistance, improve the role of women in trade, develop new markets and regional services, promote greater business interaction, assistance for capacity building of SME sector, etc. This Action Plan would be implemented through a five year period during which an Action Plan for the first year is already being finalized. Today, we have fulfilled that commitment by agreeing to a wide-ranging implementation plan to provide for greater utilization of U.S. tariff preference arrangements; provide additional information on possible mechanisms to obtain preferential market access; plan for a U.S.-Sri Lanka Business Opportunities Conference; support youth entrepreneurs; enhance Sri Lankan capacity to export food items to the United States; and further mechanisms to support Sri Lanka’s goal to serve as a regional services hub. We also discussed removing obstacles to trade and investment, establishing new modalities of investment in vocational and higher education, and collaborations on strengthening worker rights and promoting ethical and environmentally sustainable manufacturing practices. The two sides will work to finalize the implementation plan text in the coming weeks.